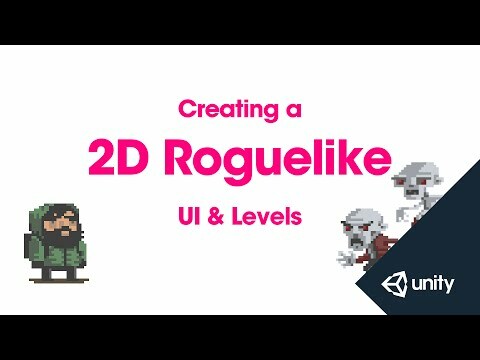 This is part 12 of 14 of the 2D Roguelike tutorial in which we create the UI and add code to the GameManager script to manage the level changes. and some text to reflect player's score. To do this we're going to use Unity's UI system. We're going to go to Game Object - UI - Canvas. as a background for our title cards. Let's go to Game Object - UI - Image. is switch over to our scene view and zoom out. to stretch this to fit by option-clicking. We're also going to set the colour to black. We'll call this Level Image. as we start and change levels. Game Object - UI - Text. We'll call this Level Text. and option or alt click the centre preset. and then dragging it to white. We'll set out font size to 32. Notice that went we do this the text disappears. hight dimensions specified in the rect transform. overflows to allow the text to overflow. and vertical overflow to overflow as well. Let's set the font by clicking on the asset picker. This font ships with the project. Finally we'll set our text default, which is going to be Day 1. And so that should be good for the level text. the level text will be deactivated as well. Next we're going to create our food text display. choose Game Object - UI - text. of the screen in the centre. while holding down the option or alt keys. Again we'll set the colour to white. Click Colour, drag to white. We're going to set the size to 24.
and we'll set our text to Food 100. Notice again that the text is being cut off. and vertical overflows to Overflow. is being displayed in front of our title card image. so it's directly under the canvas. the LevelImage and it's child LevelText. just a little bit from the bottom. We're going to do this by setting the anchors. We're going to set the Y anchor to 0.05.
and we're going to set the Max to 0.05 as well. Notice that the text hasn't moved when we've done this. But a -13 pixel offset has been incurred in the rect transform. and we'll see our text move up. to control these UI elements. and open our Game Manager in Monodevelop. and also to handle transitions between levels. so that we start on level 1 now. is the namespace declaration using UnityEngine.UI. of the type Text called levelText. to day 1 in the editor. of the type GameObject called levelImage. as we want to show and hide it. the player from moving during setup. and it's called every time a scene is loaded. after a new level has been loaded. our UI elements and setup each level. We're going to start by setting our doingSetup boolean to true. the title card is up. our LevelText to our current level number. so in this case it'll read 'Day 1'. that returns void called HideLevelImage. invoke it from within InitGame. to false so that the player can now move. parsing in LevelStartDelay as our delay time. we're going to wait 2 seconds before turning it off. check for DoingSetup to our If statement. saying how many days they've survived for. 'After level number of days you starved'. We're also going to enable our black background. Lets save our script and return to the editor. of the type Text called foodText. of foodText to the current Food score. after we've subtracted from the player's food points score. along with their current food points. We're going to do the same thing for soda. the player lost when they were attacked. to our FoodText object to our player. to our FoodText variable slot. Let's play our scene and give it a try. So we see our title card displays, that's working. When we move our Food text updates. We get our delay before moving to a new level. Title card displays with the updated level number. we see our -10 message. And so it looks like everything is working. along with the scripts that we need to control them. Please note that this lesson has been updated to reflect changes to Unity's API. Please refer to the upgrade guide PDF in your asset package download or available directly here. using UnityEngine.UI;                   //Allows us to use UI. public float levelStartDelay = 2f;                      //Time to wait before starting level, in seconds. public float turnDelay = 0.1f;                          //Delay between each Player turn. public int playerFoodPoints = 100;                      //Starting value for Player food points. [HideInInspector] public bool playersTurn = true;       //Boolean to check if it's players turn, hidden in inspector but public. private Text levelText;                                 //Text to display current level number. private GameObject levelImage;                          //Image to block out level as levels are being set up, background for levelText. private int level = 1;                                  //Current level number, expressed in game as "Day 1". private List<Enemy> enemies;                          //List of all Enemy units, used to issue them move commands. private bool enemiesMoving;                             //Boolean to check if enemies are moving. private bool doingSetup = true;                         //Boolean to check if we're setting up board, prevent Player from moving during setup. //Assign enemies to a new List of Enemy objects. //This is called each time a scene is loaded. //Add one to our level number. //Call InitGame to initialize our level. //While doingSetup is true the player can't move, prevent player from moving while title card is up. //Get a reference to our image LevelImage by finding it by name. //Get a reference to our text LevelText's text component by finding it by name and calling GetComponent. //Set the text of levelText to the string "Day" and append the current level number. //Set levelImage to active blocking player's view of the game board during setup. //Call the HideLevelImage function with a delay in seconds of levelStartDelay. //Clear any Enemy objects in our List to prepare for next level. //Set doingSetup to false allowing player to move again. //Check that playersTurn or enemiesMoving or doingSetup are not currently true. //If any of these are true, return and do not start MoveEnemies. //Call this to add the passed in Enemy to the List of Enemy objects. //Add Enemy to List enemies. //Enable black background image gameObject. //Coroutine to move enemies in sequence. //While enemiesMoving is true player is unable to move. //Wait for turnDelay seconds, defaults to .1 (100 ms). //Wait for turnDelay seconds between moves, replaces delay caused by enemies moving when there are none. //Loop through List of Enemy objects. //Call the MoveEnemy function of Enemy at index i in the enemies List. //Once Enemies are done moving, set playersTurn to true so player can move. //Enemies are done moving, set enemiesMoving to false.